Welcome to WildMess Records. 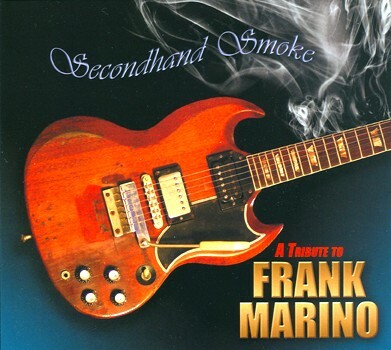 We are proud to announce the release of "Secondhand Smoke - A Tribute to Frank Marino". The release date was December 8, 2005 and is available right here on this site. You may contact us via Email below if you are interested in distributing this CD or if you have any questions or comments. Please visit the message board over at www.mahoganyrush.com to read the reviews. There are 4 ways to purchase...(1) US/Canada (2) International (3) Mail Orders (4) Digital Download. Please read carefully. (1) USA and CANADA Orders Only! USA and CANADA Only! Use other table below for International Orders. Change quantity on checkout page, then click the update cart button. Review cart before purchase. Change quantity on following page and then click to update cart. Please allow 14 business days before contacting us regarding your shipment. If after the 14 business days you haven't received your shipment, please contact us via email at wildmess@gmail.com. We will respond within 3 days. Do not file a complaint with PayPal before 14 business days or contacting us to track down your shipment. ***New higher shipping rates. I was eating the cost, but they really raised the rates. ***If you want more than 2 CD's, you must use the email form below and include your shipping address along with the quantity desired. You will receive an invoice directly from us with the amount needed. We accept money orders that are valid for U.S. currency only. No Checks. Please make sure that your email is correct AND the shipping address is correct. We will contact you if there are any problems. Please allow 4-6 weeks for delivery for orders outside the U.S. that require customs forms. You should contact us by email after 3 weeks and we can provide you with the shipping info. Do not open a PayPal claim without contacting us first and receiving a reply. Use this email form if you need to order more than 2 CD's shipped outside the U.S./Canada. We will send you an invoice, so please provide your mailing address. You may use the form for questions/comments as well. 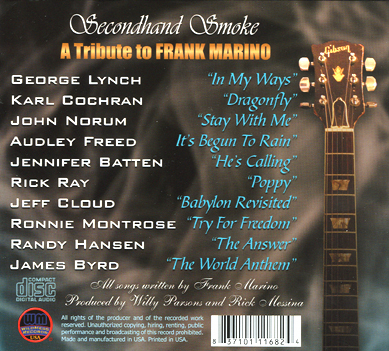 Use this banner if you would like to advertise the Frank Marino Tribute CD on your website. Download and save it. No hotlinking. ©Copyright 2005 WildMess Records™. All Rights Reserved.